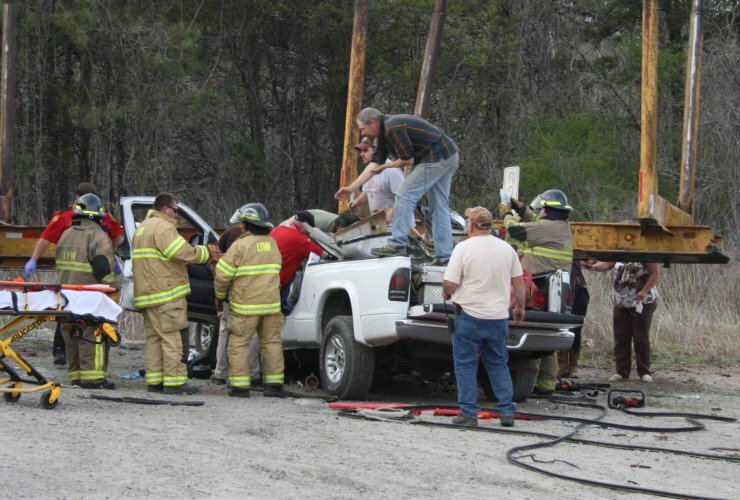 A single vehicle accident Wednesday afternoon at 5 p.m. at the intersection of Highway 13 South and Highway 278 at Natural Bridge left two seriously injured. The exact cause of the 2001 Dodge pickup to speed through the intersection, leave the highway and crash into a parked empty logging trailer is unknown. However, it is suspected the driver Charles Tucker, 56 of Lynn, may have had a medical problem. His son Austin Tucker, 16, was a passenger and it appeared Austin was trying to stop the vehicle when it impacted with the trailer. 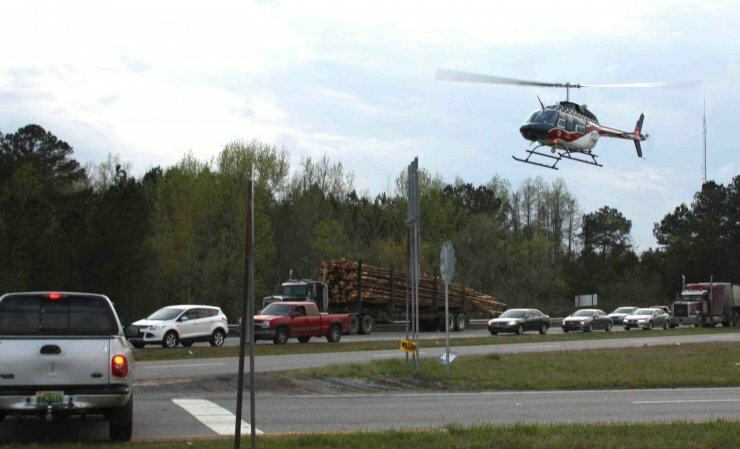 Both Charles and Austin Tucker were flown by helicopters to UAB medical center in Birmingham. Tucker, a member of the Lynn Fire Department was returning home with his son from a grass fire. Members of the Lynn Fire and Rescue worked diligently with the jaws of life to extract both from the tangled wreckage. 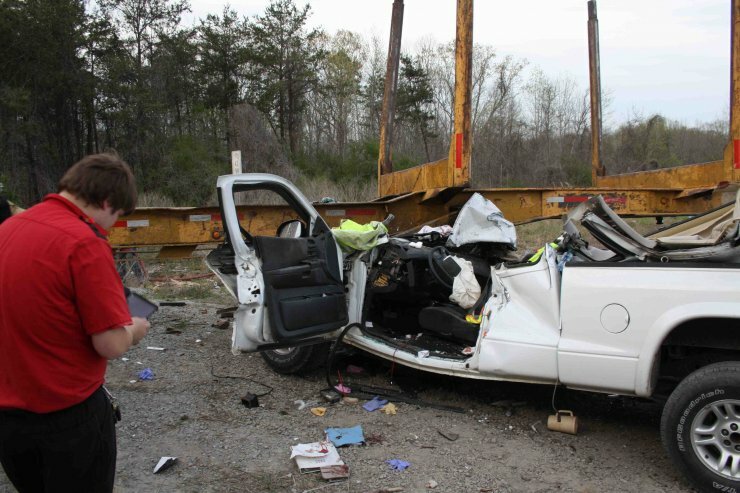 The crash was investigated by Alabama State Troopers. As a follow up to the crash last Wednesday, we are saddened to learn of the death of Charles Tucker who passed away on Saturday. 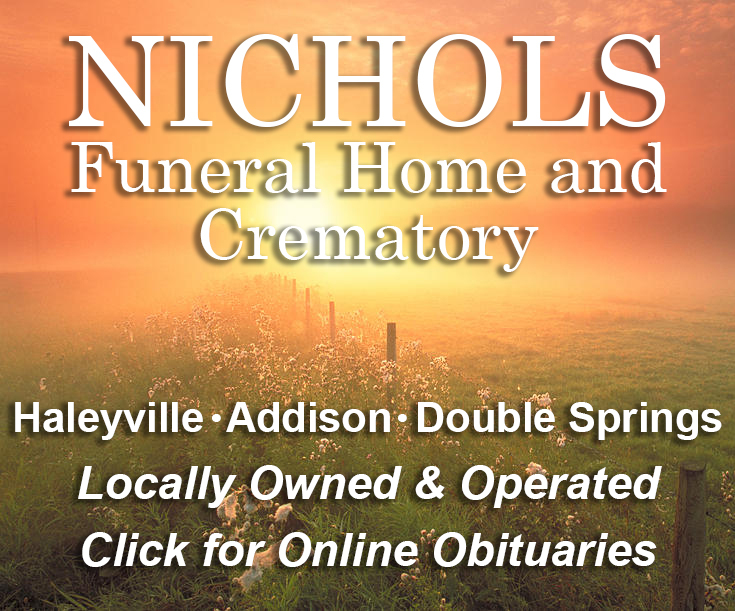 His funeral arrangements will be announced by Nichols Funeral Home of Haleyville. Reportedly, his son 16-year-old Austin Tucker suffered a broken leg and is recovering. 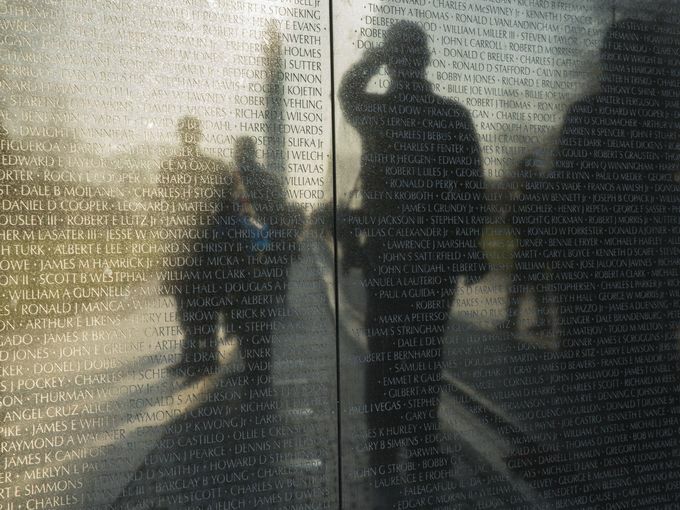 Today is Vietnam Veterans Day. On this day, March 29 in 1973 the final troops returned to the U.S. from Vietnam, marking the end of U.S. involvement in the war. To all my fellow Vietnam Veterans, I wish you a great day! 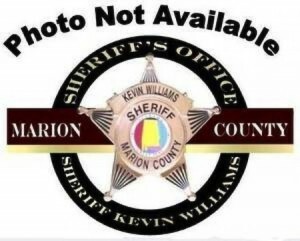 The Marion County Sheriff’s office has arrested three men in connection with the early Sunday morning stabbing and death of Josh Key of Double Springs. Key was pronounced dead on arrival at the Lakeland Hospital ER from multiple stab wounds. Key and the three other men arrested had gone to an undisclosed residence off Cherry Hill Road where the four confronted the man who lived at that residence. A serious altercation ensued resulting in the occupant of the residence being injured and the stabbing and death of Key. All three men arrested were reportedly from the Haleyville area. Arrested and charged were Austin Shirley, 22, Assault 1st Degree and Burglary 1st Degree; Jimmy Williams, 43, Felony Murder, Assault 1st, Burglary 1st; Trent Caldwell, 22, Felony Murder, Assault 1st, Burglary 1st, Bench Warrant. All three are presently being held in the Marion County Jail, their hearing is set for May 2. The Haleyville Lions Club will be hosting its Annual Easter Egg Hunt this coming Saturday on March 26 at 10:00 A.M. It will be at the Haleyville High School Football field. There will be 10,000 plastic eggs with candy and prizes spread out all over the field. 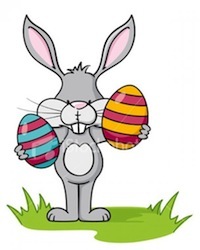 There will also be Easter egg baskets given away at the end of the event. Each child will receive a ticket when they enter the field for the drawing. So don’t leave until all baskets are given away to the lucky winners. There will be bags available to use during the hunt but we want you to bring your own basket if you like. On Thursday, the Haleyville Rotary Club had a very special guest, Shelby Shipman. Shelby, an 8th grader at the Haleyville Middle School was recognized as the top salesperson for tickets to the Rotary BBQ dinner held last fall. This is the third year in a row Shelby has won that top honor. 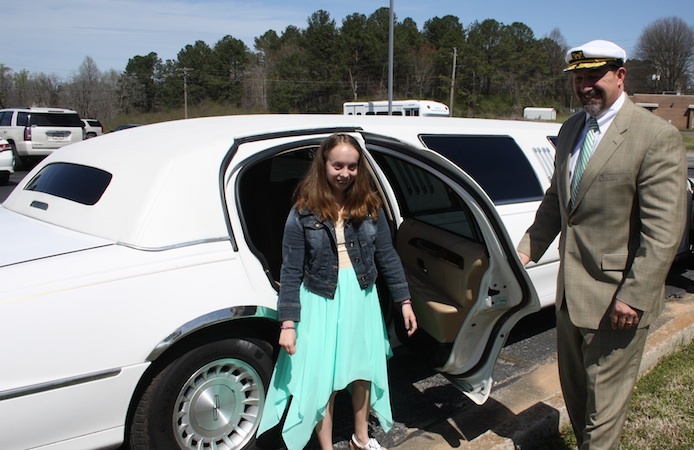 As a special treat, she and her parents, Scott and Lisa Shipman were picked up at the school and brought to the lunchtime Rotary meeting in a stretch limo driven by the Rotary President, Todd Barton. The money made by the Rotary Club at the dinner was distributed with checks for $1,250 each to the principals Holly Sutherland, HHS, Bo Wilcoxson, HMS and Wayne Frazier, HES. The Haleyville Rotary Club meets each Thursday at noon in the board room of the Lakeland Community Hospital. Wednesday morning, a large dump truck loaded with mostly muddy dirt, headed south on Highway 13 at the intersection of Highway 195, pulled away from the traffic light. As it did, pins holding the back gate in place failed and the truck dumped a load of dirt on the highway for almost a block. 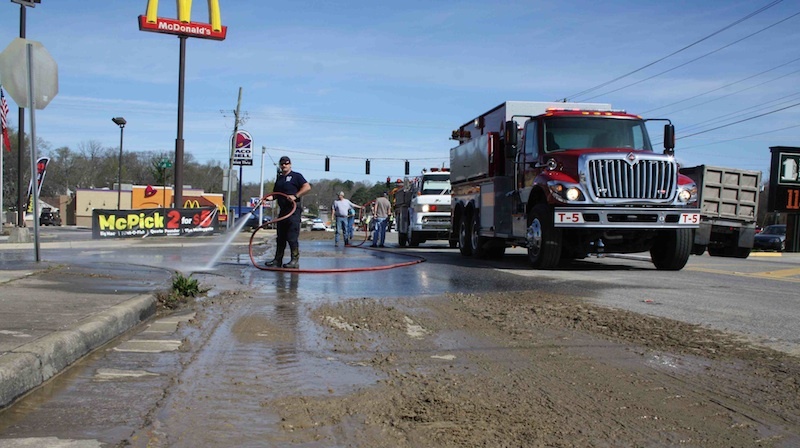 The Haleyville Fire Department dispatched a pumper and tanker to wash the road and sidewalk clean. The irony is the mud was washed into the storm water drain and will, over time, return to where it originated at the construction site of the new culvert the state has installed at the intersection Highway 13 and 8th Avenue. The Winston Marion Arc Easter pageant will be Saturday, March 19 at 5:00 p.m. at the Haleyville Elementary School. The pageant is for girls ages 1-12. Entry forms for the pageant are available at the Arc, the Sunrise Shop, Dr. Palmers office, and the Blue Kangaroo. The deadline for the pageant is Thursday, March 17. The rehearsal for the pageant is Thursday, March 17 at the Haleyville Elementary School from 4:00-5:30. 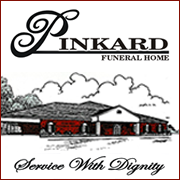 For more information, call 486-2178. It’s that time of the year to clean up your yard, trim those trees of dead limbs. Perhaps you have a tree way to close to your house for comfort and ready to fall on your house the next time we have a storm. You know better than to try doing the work yourself. Call TREES-R-US. With the right equipment and trained personnel to clean up your yard or larger property, TREES-R-US is just a phone call away from a free estimate. 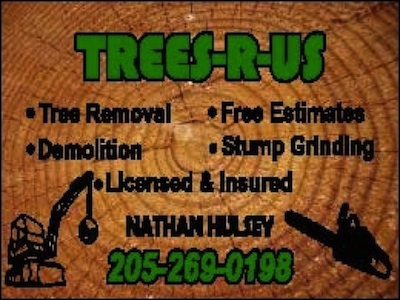 Call Nathan Hulsey today, on his cell, 269-0198. Mention you saw it on hbtv.us. Nathan will treat your right and the price is right. 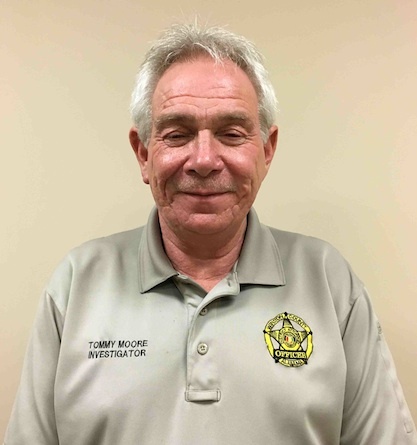 Governor Robert Bentley has officially announced the appointment of Tommy Moore as the Sheriff of Winston County. He will assume his duties on Monday, March 14. Moore has been working as the investigator for the District Attorney for 18 years and has 27 years in law enforcement. He was chosen over five other candidates whose names were submitted to the governor. In an interview with WWWH 92.7 news, Moore said his first goal as the new sheriff was to get the deputies to become more interactive with the people in the county. He said he plans to lead by example. The biggest problem he said is narcotics, more specifically, Ice which is a more pure form of meth. No changes are expected initially in the personnel. He said he plans to do the best job he can. He said: “I want to be Sheriff of Winston County, because I care about the people of Winston County. Listen to the interview on the Paradise 92.7 at 6:30, 7:30 a.m. 12 noon and 5:30 each day. There will be a public swearing-in Monday evening at 6:30 in the court room of the old court house. 1. Advertising for bids for the Cripple Creek Neighborhood Improvement Grant. 2. Advertising for bids for Airport Hangar Replacement Project Grant. 3. Three change orders for work at the new Haleyville Sports Complex were considered. Two of the changes were approved which will add electrical power for the irrigation system. One change for the restrooms was tabled. 4. Purchasing fencing from the lowest bidder in the amount of $176,372.00. 5. Bid for paving 23rd Street between 9th Avenue and 10th Avenue in the amount of $25,430 from Shoals Paving. 6. Bid for paving 18th Avenue at Crossway Church in the amount $23.430 from Shoals Paving. 7. Advertise for bids for sidewalks at the Sports Complex. 8. Advertise for Seasonal worker at Park and Recreation Department. 9. Advertising for lifeguards at Park and Recreation. 10. Hired full-time fireman Philip Pratt to replace retiring Tommy Lewis. 11. Purchasing deck for Kubota tractor for Park and Recreation for $1,884. 12. Appointed Billy Ray Parson to Solid Waste Disposal Authority Board. Lauren Tinker made a short presentation thanking the council and the city and requesting assistance again this year for the upcoming annual Mark Forester Price of Freedom Run. The next meeting of the Haleyville City Council will be Monday, March 21 at 5:30 at City Hall.